Globe Electric's Incandescent vintage designer 60W Vintage Edison S60 Squirrel Cage Incandescent Filament Light Bulb with E26 base. In the early days of electrical lighting, inventors such as Thomas Edison tested and retested as they searched for long-burning filaments. In 1890, the filament choice was carbonized cotton. Globe Electrics bulbs have a tungsten filament, which is used to reproduce the single hairpin loop of a vintage design. Position it within a clear shade or exposed socket to enjoy its shape and ambient glow. This Edison inspired bulb is a Steampunk favorite with its glowing cage-shaped filament surrounding a central glass support. Crafted to preserve the look of early 20th-century lighting. Please note, these bulbs are not as bright as modern bulbs of the same wattage and are recommended for exposed socket fixtures. Glass has a goldish amber tint which can vary in degree from light to medium. These bulbs can be dimmed and have a lifespan of 3000 hours. TUNGSTEN FILAMENTS: specially designed & shaped bulbs with Imported Tungsten Filaments givies your home that extra special unique/warm touch! 8440501 60W Vintage Edison S60 Squirrel Cage Incandescent Filament Light Bulb, E26 Base, 12 Pack Globe Electric's Incandescent vintage designer 60W Vintage Edison S60 Squirrel Cage Incandescent Filament Light Bulb with E26 base. In the early days of electrical lighting, inventors such as Thomas Edison tested and retested as they searched for long-burning filaments. In 1890, the filament choice was carbonized cotton. Globe Electrics bulbs have a tungsten filament, which is used to reproduce the single hairpin loop of a vintage design. Position it within a clear shade or exposed socket to enjoy its shape and ambient glow. This Edison inspired bulb is a Steampunk favorite with its glowing cage-shaped filament surrounding a central glass support. Crafted to preserve the look of early 20th-century lighting. Please note, these bulbs are not as bright as modern bulbs of the same wattage and are recommended for exposed socket fixtures. Glass has a goldish amber tint which can vary in degree from light to medium. These bulbs can be dimmed and have a lifespan of 3000 hours. 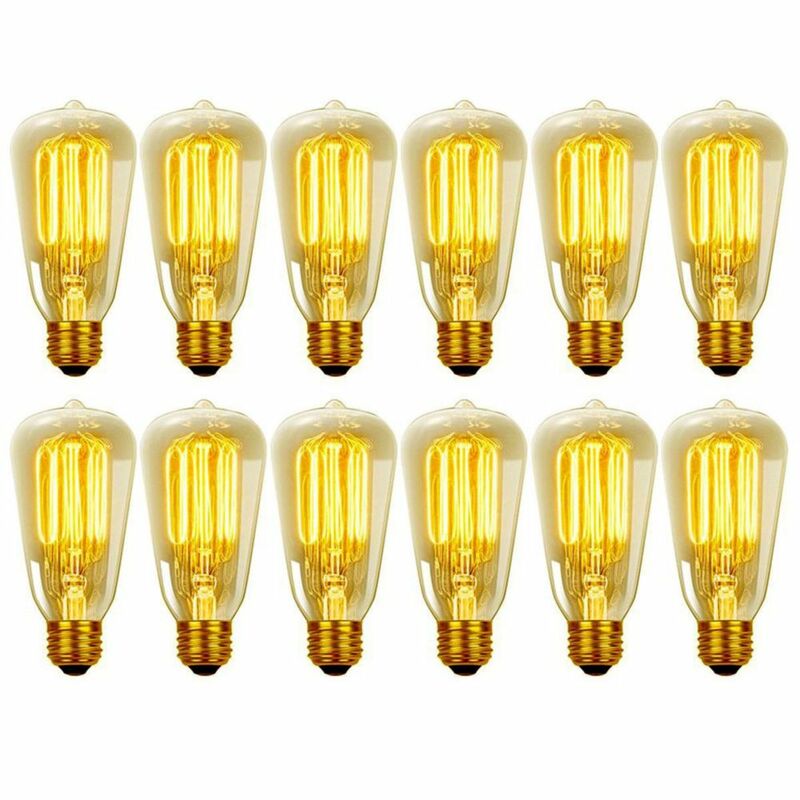 8440501 60W Vintage Edison S60 Squirrel Cage Incandescent Filament Light Bulb, E26 Base, 12 Pack is rated 4.3 out of 5 by 10. Rated 1 out of 5 by Brenda from This bulb is too dim for a bathroom. Better suited... This bulb is too dim for a bathroom. Better suited for a romantic dinner somewhere. Rated 5 out of 5 by Judith from love the vintage look!... love the vintage look! Rated 5 out of 5 by AM112 from Beautiful! Bulbs emit a beautiful soft golden light. Not as bright as regular bulbs, as others have written, but out distance regular bulbs on ambiance and beauty. Rated 4 out of 5 by VIC from great bulbs beautiful rustic look with the brightness of a regular bulb.